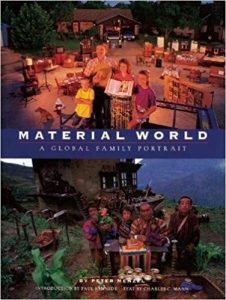 A quarter century ago Peter Menzel published his remarkable book, Material World. Subtitled A Global Family Portrait, it portrayed statistically average families representing thirty nations. The most memorable feature of the book was a series of photographs of each family’s worldly goods: they’d emptied their homes for the photographers and deposited all of their material possessions in front of the homes so that these fascinating collections, meager or extensive, could be photographed. Think of all of the objects you have in your home. Almost every one of those items arrived with the promise that it would in some way make your life richer, fuller, better. And almost without exception, every one of these items ended up with you taking care of it: you have to wash it, wax it, renew its registration, dust it, change its oil or its batteries, update its software, or otherwise service it in some way. Possessions we acquired to make our lives better now possess us instead. It occurs to me that giving up whatever promised to make our lives better, but doesn’t serves us as intended, is worth doing. For example: fear’s original purpose was to help us human beings survive in a dangerous world. But some fears we may own now are, like snowmobiles and salad shooters, far more trouble than they’re worth. What if we gave up some of our fears for Lent? Suppose we gave up our fear of being found out for who we really are? The fear of being different, unlovable, hopelessly inadequate, or too strange for anyone to like us? Jesus emphatically said, “Love your neighbor as yourself.” Meaning we are worth being loved by ourselves. And what if we gave up our fear of our neighbor? You know, the one whose skin color, foreign origins, socio-economic class, politics, or sexuality prompts useless, burdensome fear. We might find that once Lent is over we don’t need to resume these fears. Or at least that they wouldn’t stick to us quite as stubbornly after Easter Sunday. Today, April 11, is the twelfth anniversary of Kurt Vonnegut’s death.